Relatively new to the world of pottery; about 5 years making, developing and honing my skills, I get much of my inspiration for making little tea-light houses from views of my local surroundings. 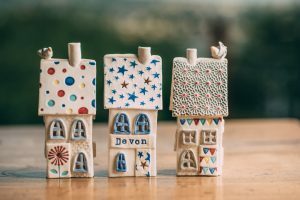 My village, Shaldon, on the South West Coast is full of cottages which are all different shapes and sizes, many quirky, and this is what I try to emulate in my porcelain houses. 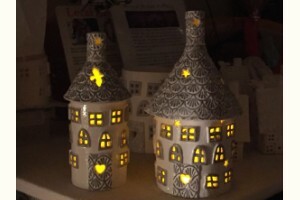 I cut as many windows and star shapes into the houses as I possibly can, this then enhances the the overall effect of the piece and it comes alive when a tea-light is placed underneath. The houses look amazing perched on the edge of a mantelpiece, hearth, bay window or wooden bookcase. It is the same story with the little boats that I make. Why make it plain when you can add vibrant colour and pattern! I prefer to use porcelain as my medium as I find that a greater depth of colour can be achieved. Each piece is fired twice, the first part of the process to 1000 degrees. Glaze is then added and it is re-fired to 1180 or 1240 degrees. I also make wall hanging objects, such as hanging boats, hearts, stars and very cheeky seagulls. Some creations change shape and warp in the kiln, but I believe this only adds to enhancing their uniqueness.